If you Google “Sheet Pan Meals” these days, you’ll find thousands of great ideas! But how to make them with whatever you have on hand? And make sure that you have a balanced meal, including important nutrients? Sheet pan meals can be a great way to get meal prep done efficiently and to get delicious and healthy meals on the table quickly! Here’s our guide. In terms of putting together balanced meals, the most important ingredient on the pan should be the vegetables! Choose two or three vegetables that you like to eat together. Decide which takes the longest to cook and start with that one on the pan. Usually root vegetables and hard vegetables (like carrots, squash, and potatoes) take the longest to cook, followed by soft vegetables (peppers, eggplant, zucchini, and onions.) Proteins can be added next. Peas, corn, or cooked legumes can be added for the last few minutes of cooking, just to heat through. Top it all off with some fresh garnish or a flavorful sauce, and dinner is ready! I like to use a high oven temperature to roast vegetables and proteins without drying them out, and to make sure we get some light caramelization, for best flavor. I tested these recipes at 450F, but you will have to experiment with your oven temperature and times to figure out your best results. If it is taking a very long time to get a little color on your meals, turn the oven up a little the next time. If items are browning, but not cooking through, turn the oven down a little the next time. You’ll soon have no trouble knowing which temperature works best for your taste. Try to think about what flavor profile you want to achieve and choose your spices and herbs accordingly. Southwestern and Mexican dishes use garlic, cumin, fresh or dried chiles, oregano, cilantro, and lime juice. Asian dishes can include ginger, garlic, chiles, Chinese 5-spice, fresh cilantro, mint, basil and green onions, along with soy sauce or fish sauce, sesame oil, and rice vinegar or lime juice. Mediterranean flavor profiles include fresh or dried herbs like basil and oregano, garlic, and acidic elements like balsamic vinegar or lemon juice and zest. To make your meal delicious, and to prevent drying out of your vegetables, it’s important to coat them with a marinade or a light coating of oil. A marinade is a good place to add dried herbs and spices and coat your vegetables and proteins with flavor. A touch of honey can balance out acidic flavors, like balsamic vinegar or lime juice, and also promote browning. Allow proteins to marinate for 30 minutes up to overnight. Proteins can also be frozen in resealable bags in their marinade, before cooking. Then, they marinate themselves while thawing overnight in the refrigerator. Liquid oils are best to use, for ease of marinating. I usually use olive or avocado oil, but you may use your choice of fat. 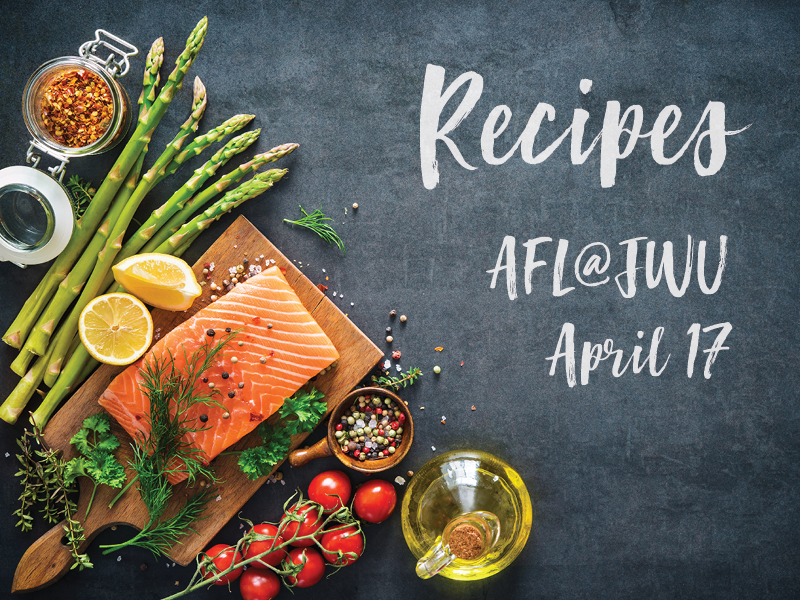 Our recipes today include Curried Chickpeas and Cauliflower, with an Indian flavor profile, 5-Spice Roasted Salmon with Sesame Asparagus, and Southwestern Fajitas. I hope they will become favorite recipes of yours, and a helpful introduction to sheet pan meals! Potatoes would make a nice addition to this dish, as would fresh or frozen peas. This raita is a vegan version, but you could substitute plain yogurt for the cashew cream if you prefer. Turmeric 1 – 2 t.
Salt ¼ – ½ t.
Cumin seed, toasted ½ t.
Line a sheet pan with a parchment sheet. Mix together the oil, Garam Masala, Turmeric, and Salt to make the marinade. Place cauliflower florets and sliced red onion in a bowl and add the marinade. Toss to coat. Bake for 15 minutes, then add the drained chickpeas, and stir to coat chickpeas with marinade. Bake for 10 minutes, until cauliflower and onions are soft and lightly browned, and chickpeas are lightly browned. While vegetables are in the oven, make the carrot & cumin raita: Place the cashews in the blender jar. Boil the water and pour over the cashews. Add the ginger, garlic, and lime juice, and allow the mixture to cool slightly, about 15 minutes. Blend until smooth and add the carrot and cumin seed. Chill before serving. When vegetables are finished, remove pan from oven and garnish with cilantro. Serve with carrot & cumin raita. Place sliced chicken, peppers, and onions into a bowl or a resealable plastic bag and add the marinade. Seal the bag and mix to coat the chicken and peppers. Place the chicken and vegetables into the refrigerator for 30 minutes to overnight. Place chicken and vegetables on sheet pan lined with parchment. Bake for 10 minutes and stir the chicken and vegetables. Bake for 10 – 15 more minutes, until the chicken and vegetables are cooked through, and lightly browned. Place tortillas on top of chicken and vegetables and cover with aluminum foil. Return to oven for 5 minutes. Serve fajitas with shredded cheese, sour cream or Greek yogurt, and avocado slices if desired. Green Onion, finely chopped ¼ c.
Prepare rice by mixing rice and water in a pot and bring to a boil. Cover, reduce heat to low, and cook for 20 minutes without removing the lid. Once time is up, remove pot from the heat, remove lid, and fluff the rice. Allow to stand for 5 minutes before serving. Mix brown sugar and 5-spice powder, and place onto a small plate. Cut salmon into portion size pieces, press into the sugar and spice mixture, and place onto sheet pan, sugar side up. Toss asparagus pieces with sesame oil and place onto sheet pan with salmon. Place into oven and bake for 15 – 20 minutes, until salmon and asparagus are browned and cooked through. Sprinkle asparagus with sesame seeds and salt. Serve salmon with asparagus and jasmine rice, sprinkled with green onions.